It's that closet. Yes, that one. Usually upstairs by the guest bathroom. Stuffed to the max. We excuse the clutter as we don't open the closet door that often. We only go "in there" when we are sick and need cough medicine (once a year? ), or for a new toothpaste, toilet paper roll, or shaving cream (twice a month). But you know. You know when you walk by the closet, you block it out - you block out the thought, "I need to organize my linen closet and get rid of the old stuff". And you think, oh, another day, I don't have time for it. What we fail to realize is in that moment with those thoughts, you spent energy in a negative way, and can never get that energy or moment back. It's spent. And that negative thought is stored in your cells. Maybe just a few cells, but nonetheless, it's there. And that was just for one time. Multiply that by the numerous times you walked by that closet, had that thought, and how many times in other parts of your house did this occur? Possibly this will help you discover why your body and mind feels heavy, low energy, and never feels good enough. Let me organize your home, which will allow your body and mind will feel lighter and empowered. Even in a linen closet, every item has a home. 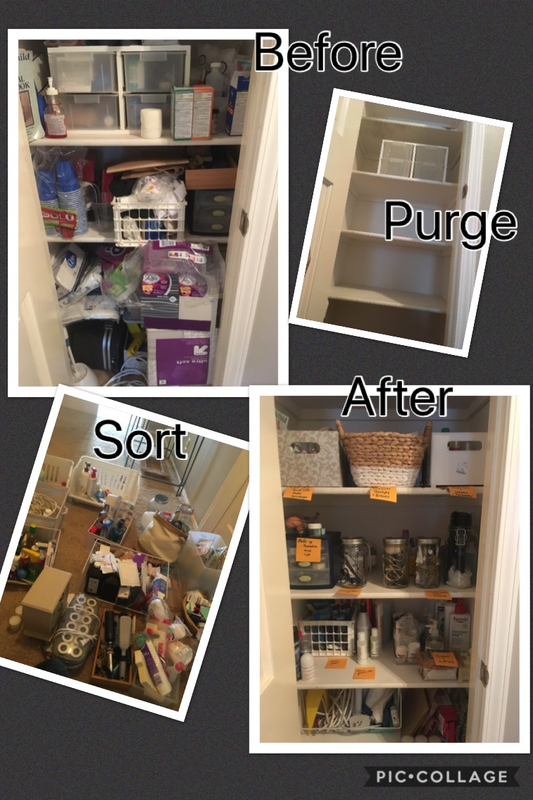 The time has come to "purge" or "empty" the linen closet and organize with an intentional system. Most people will just go out, buy containers, come home, put the items in the containers hoping they fit, and put back into the closet. If you can imagine, the frustration, rushing, and sweat and tears that comes from simply trying to be organized - but not following a process and creating a system. Instead of tackling one shelf at a time, or just the big items, and "straightening up" by putting them into a different spot or an empty hole, it's most effective to empty the entire closet. I set up a few holding containers for each category. Some of the categories included body care, oral care, make-up, supplies, house cleaning, hair supplies, and household items. Placing the items into their respective category allowed to see how much of each category and then find its properly sized container. This purging process also includes getting rid of the expired over-the-counter medicines, samples from hotels from years ago, items that have another home (in another part of the house), and understanding the frequency you open the closet for each category. The placement of items, or its home, on each shelf is very important. If you have make-up in the closet, and you visit the closet daily for those items, you certainly want it on a shelf at eye level (opposed to on the bottom shelf which would mean lots of bending over, or even the top shelf which would mean lots of reaching). The post-its are a temporary labeling system to allow the placements to be lived, and easily shifted if necessary. It's important to listen to your inner voice if something doesn't feel right, or if you always look at the top shelf for item A, however, it's been placed on another shelf. Save yourself from wasting that energy by looking twice for the one thing, and we would move the item A to the top shelf where you first looked! In the end, each category and item has a home, and this will also show when something is missing and you need to buy the replacement. Most of the categories also have a container to help from over-shopping, as well as easiness to find the item. Now, when she walks by the closet, she doesn't even need to open the door, as she "knows" how good it feels inside the closet. Her body and mind are filled with positive thoughts and energy, and she walks with a spring in her step with a sense of empowerment.